Dr. Louisa Moats has recently recorded a three part podcast on reconciling the Common Core State Standards in English Language Arts with Reading Research. Teaching is a puzzle that keeps me thinking all the time. In my work with students who have learning disabilities, statistics prove that the most beneficial and most effective educational approaches include “explicit, systematic, cumulative, and multisensory” instruction. But what may seem like a straightforward plan is not always so easily implemented. Depending on the student, one needs to be systematic or creative or systematically creative. It’s a question of tuning and retuning and fine-tuning as progress is made and setbacks are faced. Many elementary school teachers have limited resources related to dyslexia and other learning differences. 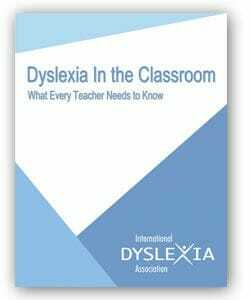 Dyslexia in the Classroom: What Every Teacher Needs to Know was developed to open the door for these educators to a better understanding of dyslexia. This handbook is intended to support all teachers in their passion to help every child reach his or her fullest potential. Use it to raise awareness, share best practices, and be a resource to your school’s administration and staff. We encourage you to share this handbook with as many people as possible. The more educators we can inform, the more children we can help! In addition to offering valuable information about dyslexia and its characteristics, this handbook provides information on assessments, effective teaching approaches, self-advocacy ideas, and a vast array of resources. Further, the handbook contains information that will be useful throughout a child’s life, from elementary school through college. The degree of difficulty a child with dyslexia has with reading, spelling, and/or speaking varies from person to person due to inherited differences in brain development, as well as the type of teaching the child receives. 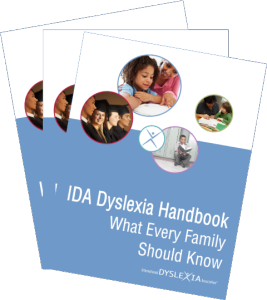 It is crucial to be able to recognize the signs and symptoms of dyslexia so that a child can be evaluated early and obtain the appropriate instruction and accommodations he or she needs to succeed in school. We encourage you to share this handbook. 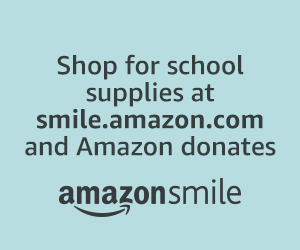 The more families we can inform, the more children we can help!